We eat ham, and jam, and spam a lot. Monty Python, the most beloved English comedy export, has been busy in Broadway with their stage musical version of Monty Python and the Holy Grail which, in its theatrical incarnation is called Spamalot. Doubts are always cast on film to stage adaptations because without the luxuries of film editing, special effects and the chance to do a scene in several takes, how good can they really be? 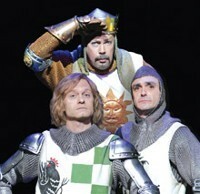 Well, in this case, really rather good indeed: Spamalot won three Tony Awards earlier this year and sounds like it improves on the inimitable silliness of the film rather than depreciates it. However, we can only speculate at the moment just how great the show is... because we haven't seen it. It has not been performed in the UK as yet: the bastards on Broadway still haven't sent it over to our West End. Back in June, director Mike Nichols made a promise to bring it over to our shores for "some point in 2006" which is a little too vague for our tastes and not exactly promising (or a promise). But the latest news bodes well for London audiences who want to see a full chorus of knights in armour singing the Camelot song: Really Useful Theatres, owner of mostof the big theatres in the West End has entered into discussions with Spamalot's producers about putting the show on in either the Palace, Adelphi or Cambridge Theatre, so a good West End run for the Python team looks likely. This West End transfer would mean ousting one of the shows currently featuring in those venues - in order to welcome in the Knights who say "Ni!" London may have to say goodbye to The Woman in White, Chicago or Dancing in the Streets. That's a tough choice to make: should London have the Black Knight with his arm off ("it's just a scratch") or a C-list celebrity dancing about in fishnet stockings? We know what we'd prefer. Really Useful Theatres: Bring. It. On.